The end of the semester has been particularly busy, so it’s been a while since my last blog post. I’m planning on doing a number of posts in June, but until then I can announce some upcoming events. The event I want to focus on here is a major conference being planned for western New York state addressing how the biblical accounts of creation might be compatible with contemporary evolutionary accounts of the cosmos and humanity. The conference, entitled “Genesis Recast: The War with Science is Over,” is scheduled for September 18-19, 2015 (Friday evening and Saturday) at The Chapel at Crosspoint in Getzville, NY. The conference is organized by Jim Walton (brother of Old Testament scholar John Walton); he will host the conference and introduce the speakers. After having been involved in pastoral ministry in Buffalo, NY for over twenty years, Jim became Founder/ President of The 3rd Choice, an apologetics/ evangelistic/ discipleship website designed to engage people in conversation about matters of faith. The rationale for the conference is that Genesis 1-2 is a huge obstacle to faith in our country right now. Millions of students are turning away from faith because of “science,” and they think that the early chapters of Genesis have been proven to be fictional. Millions of Christian students are struggling to reconcile Genesis 1-2 with contemporary science, and it’s an unnecessary tension. This conference intends to help change the conversation. The keynote speaker is Dr. John Walton, professor of Old Testament at Wheaton College. 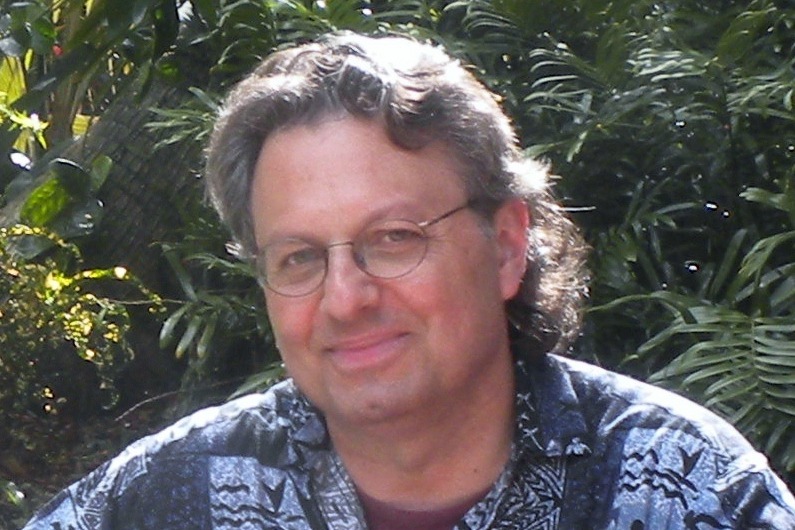 He will give two talks, Friday night and Saturday morning, which will focus on the material from his books The Lost World of Genesis One (IVP Academic, 2009) and The Lost World of Adam and Eve (IVP Academic, 2015). John Walton’s interpretation of Genesis 1 and 2 is informed by contemporary biblical studies and how creation accounts functioned in the ancient Near East. His approach has been immensely significant in helping evangelical Christians understand Genesis 1 and 2 better, which does not predispose us either for or against evolutionary science; that needs to be studied on its own merits. Walton has just completed a world lecture tour, to a very positive response on the part of the attendees. Walton’s presentation on Saturday morning will be followed by Dr. Craig Evans (a well-respected New Testament scholar from Acadia Divinity College, in Nova Scotia), Dr. Steve Schaffner (a scientist working in the area of genetics at the Broad Institute of Harvard and MIT), and Skye Jethani (a pastor, consultant, and executive editor of Leadership Journal). You can find short Bios of the speakers here and longer bios here. This is the tentative schedule for the conference. The event is being co-sponsored by The Chapel at Crosspoint, InterVarsity Christian Fellowship and Campus Ambassadors at the University of Buffalo, and the Biologos Foundation. Because the organizers/ sponsors are very excited about the conference and its potential for raising awareness of the compatibility of biblical faith and contemporary science in the entire Western NY area and possibly beyond (Pennsylvania, Ontario, Ohio), they are keeping the cost of attendance ridiculously low for an event of this caliber, in the hope that many students, professors, pastors, and others can attend. The cost for registration is $20 in advance, $25 at the door, and only $10 for students. I will post information on how to register as it becomes available. Tell your friends about this event, and let’s pack the auditorium. See a follow-up post on the conference here. 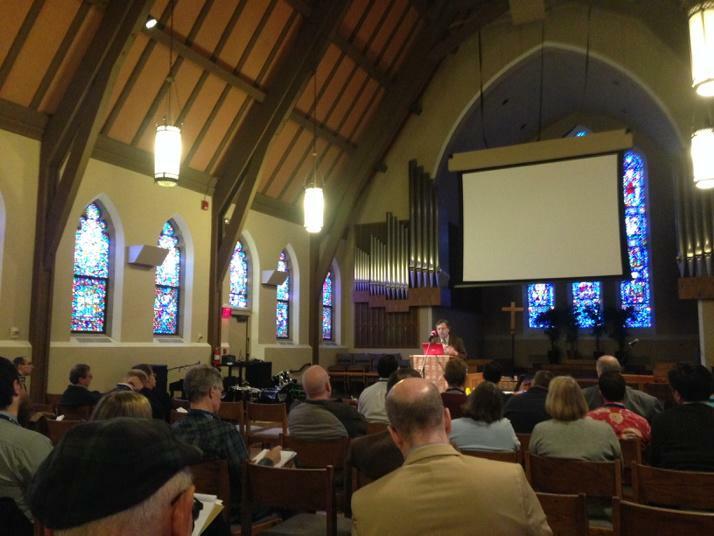 I promised a report on the the March 26-28, 2015 conference of the Colossian Forum entitled “Re-imagining the Intersection of Evolution and the Fall” held at Garrett-Evangelical Theological Seminary in Evanston, IL. I’ve been back for a week now, so it’s time to share some of my thoughts. In general, I had a stimulating time of listening to thoughtful speakers and networking with a variety of scientists, theologians, philosophers, historians, and biblical scholars—a very worthwhile event. My presentation on “Reading Genesis 3 Attentive to Human Evolution” was well received, and resulted in many great conversations afterwards. Photo of me giving my presentation on March 27, tweeted by Jamie Smith. While at the conference I had a meeting with Jim Kinney and Steve Ayers, from Baker Academic (the publisher of my latest book, A New Heaven and a New Earth). Jim invited me to publish my next book with them, something I am happy to do. It is tentatively titled The Silence of Abraham, the Passion of Job (on lament prayer). I just sent Baker Academic a preliminary proposal. What was my basic takeaway from the conference? There were two main points that struck me as important. The first thing that struck me is that there are many orthodox Christian scholars, working in different fields, who fully embrace the evidence for the biological evolution of humanity over millions of years; they have no trouble being committed Trinitarian Christians while taking evolution seriously. This was a heartening realization, because it coheres with what I believe should be the outworking of a biblical doctrine of creation. Believing that the Creator made a world that is “very good” (Gen 1:31) suggests that we should trust that reliable knowledge of creation is possible, and this knowledge includes the findings of science, including evolutionary science. Of course, science is an ever-changing field, as new data are uncovered, and not everything that scientists claim at a particular moment will still be claimed in the future. This is certainly true of the details of hominin evolution, including issues like precisely when Homo sapiens migrated from Africa or the precise dating of the male and female ancestors of all persons living today (which depends on understanding the rate of mutations of the Y chromosome and Mitochondrial DNA). Nevertheless, the general outlines are pretty clear and the fact of evolution is not really in dispute in the scientific community. If there was one significant difference of opinion that I picked up at the conference, it was over the issue of how we relate the Christian faith (including the doctrine of sin/the fall) to evolutionary science. While many scientists and some theologians at the conference clearly wanted to harmonize (in some way) the biblical accounts of origins and the fall with what we know (or think we know) about biological evolution, not all were convinced this was the best route to go. The first has to do with the ever-changing field of scientific knowledge. Peter Harrison (a past Gifford lecturer, who has written extensively on the history of religion and science) gave a brilliant presentation on historical attempts to relate biblical teaching about the cosmos to contemporaneous science. He showed how quickly harmonizations of the Bible and science in the modern period had to be revised, as science grew and progressed, leaving some of the authors of new books on the subject looking quite foolish. So we shouldn’t be too quick to jump to an explanation of how biblical truth relates to the latest science. But the second reason for resisting immediate harmonization is even more important. The biblical accounts of creation and fall have their own integrity, and these accounts make theological claims about origins in their own right. The danger in harmonization (laudable though it is to try and show connections between theology and science) is that we are in danger of changing what the text is actually claiming (for example, many attempts to connect the biblical accounts of origins to evolution end up denying the Bible’s affirmation of a good creation or the historical origin of human sin). We need to attend to the fact that the Bible wasn’t written to satisfy our scientific curiosity about the cosmos, but rather has a salvific and ethical purpose. This was a point made especially by theologians and biblical scholars at the conference. It was the judgment of many (though not all) at the conference that the church needs to attend to its own articulation of the significance of creation and fall, indwelling its own scriptural narratives in their full depth, without feeling pressured to make the Bible “fit” what science is currently telling us. This is not a matter of mistrusting science, but rather of respecting the integrity of the biblical witness to God’s purposes for the world articulated in texts like Genesis 1-3. I was particularly struck this past weekend, as my church celebrated the paschal, mystery followed by Easter, in a series of services, of the amazing richness of the biblical story of Christ’s victory over death, which is meant to frame all of our lives, and guide us towards holy living. Far from us needing to explain away our faith to make it fit contemporary science, the existential truth and power of this deep mystery is a guide for living and thinking, including our thinking about and our practice of science. Not all the presentations at the conference explicitly addressed Genesis 3, the the classic “Fall” narrative. But, as an Old Testament scholar, that was the focus for my own paper. When I began working on my paper, I initially framed it as an alternative to naive concordism and Non-Overlapping Magisteria (NOMA). The former approach is what I grew up with in the conservative evangelical church, where Scripture was understood as teaching scientific truth about the cosmos, including a young earth and a non-evolutionary history of biological organisms. The result is that much of modern science is rejected, and the rest is made to harmonize with Scripture. NOMA is the approach advocated by Stephen Jay Gould, the famous agnostic scientist who wanted to respect what the various religious traditions said. He therefore affirmed that their truth was of a different order from that of the sciences, so that the various “magisteria” (science and religion) could never actually contradict each other. I was dissatisfied with both approaches—the former since it doesn’t take science seriously and the latter since it seems to erect a concrete wall between science and faith that admits of no interaction. I initially conceived of my paper as an attempt to get beyond both concordism and NOMA. To that end I set out to explore various theological motifs in Genesis 2-3, such as the creation of humans and animals from the earth, the meaning of the tree of life, the prohibition of the tree of the knowledge of good and evil, the significance of the snake and its dialogue with the woman, the subsequent narrative of transgression and judgment, and the spread of sin and violence in Genesis. Along the way, I made some tentative and speculative comments about how elements of this story might relate to a virtue ethics approach to the development of moral consciousness and also with the state of our current knowledge of evolutionary anthropology. While some of my suggestions for possible connections with evolution were intriguing, in the end I came to the conclusion that our primary need is to understand the story of Genesis 2-3 in its own right before we try to relate it to evolutionary history. We need to take the time to understand (and indwell) this powerful narrative as the deepest truth of our origins as human beings and the origins of our falling out with God and one another. Only then will be in any position to think clearly about how this text might relate to human evolution. Note: The conference proceedings are now published as essays in Evolution and the Fall (Eerdmans, 2017), ed. by William T. Cavanaugh and James K. A. Smith.